The Glycemic Impact Diet isn’t a 'fad' or 'crash' method of losing weight. It’s based on firm scientific principles and can help stabilize blood sugar and aid in fat loss. Read this before you try it! It's no easy task to sort through the bazillion diet fads that roam the Internet. Among the links to an Atkins, paleo, keto, NutriSystem, and South Beach diet site, you may have tripped across something called the glycemic diet, glycemic impact, or GI diet. Not sure what it is or what it means? Allow me to assist. The glycemic diet is formed from the glycemic index (GI). If you're not diabetic or have normal blood-sugar numbers, you may be unfamiliar with the glycemic index. For those who have to constantly measure or be cognizant of their blood-sugar levels, the glycemic index is an important tool. The glycemic index was created in the 80s to help people manage and prevent diabetes. It ranks food based on the amount of time it takes glucose to get into the bloodstream. Those foods which release glucose rapidly have a higher GI; those that release glucose more gradually generally have a lower GI. Lower GI scores are better, the theory goes, because foods that release glucose quickly can cause spikes in blood-sugar. A growing number of experts believe that such spikes can a) lead to type 2 diabetes or b) be an independent risk for coronary heart disease even in the absence of type 2 diabetes. One problem with the glycemic index is that it doesn't state how much actual sugar is in each food type. In some cases, a food which ranks high on the glycemic index may release glucose quickly, but the food itself doesn't contain much sugar. As always, it's best to read the labels. This diet contains a mix of proteins, fats and carbohydrates. It focuses on carbohydrates that are lower on the glycemic scale. The diet is built upon the belief that too many carbohydrates from the wrong sources can cause the body to produce too much insulin. Excess insulin can cause side effects like dizziness, low energy levels, and intense hunger. 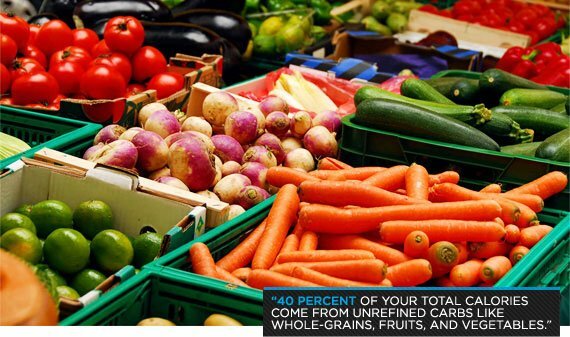 On this diet, 40 percent of your total calories come from unrefined carbs like whole-grains, fruits, and vegetables. Thirty percent of your calories will come from lean protein sources like chicken, beef, eggs, and tofu. The remaining 30 percent of your diet will consist of healthy fats like avocados, olive oil, and nuts. This diet is proven to be an effective way to lose weight in the long term. No, it doesn't promise rapid weight loss like some of the low-carb plans. Yet, precisely because you don't remove any food groups and maintain a good ratio for each, you can expect the weight to stay off. The diet doesn't mention how many calories you must consume, so it will be the dieter's job to find the appropriate calorie intake. You'll be healthier while using this diet, but you may not lose weight if you fail to count calories. It's a reasonable diet approach that can be utilized by the vast majority of the population. Unless you're specifically instructed to utilize a low-carb approach, this diet plan is something you can use for life. It's great for anyone looking for a healthy way to lose weight or maintain weight loss. It's also great for supremely active people who rely on carbs for extended energy.